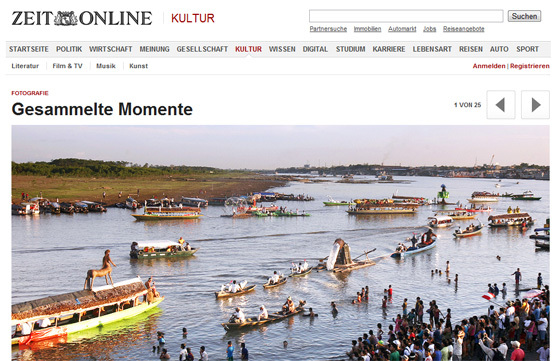 The Official Inauguration of the Amazon as one of the New7Wonders of Nature in Iquitos in the Peruvian rainforest is the subject of widespread coverage in the region’s media. 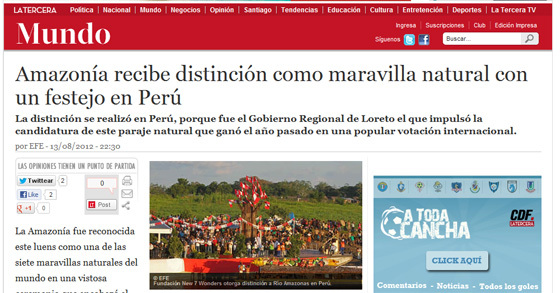 “Amazonía recibe distinción como maravilla natural con un festejo en Perú (Amazon receives distinction as a natural wonder with a celebration in Peru)” headlined Chile’s La Terca. 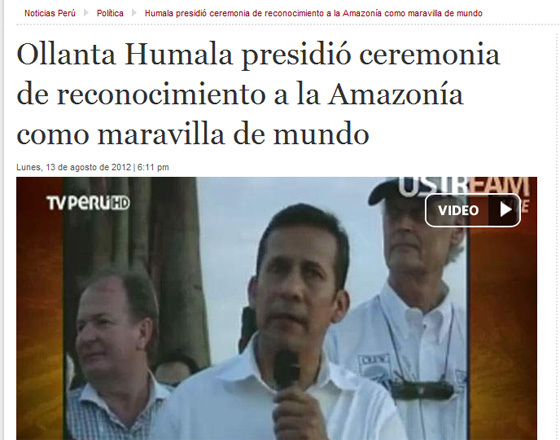 “Ollanta Humala presidió ceremonia de reconocimiento a la Amazonía como maravilla de mundo” was the headline in the Peruvian national daily, La República, which focused on the speech by President Ollanta Humala at the Official Inauguration ceremony in Iquitos. The President of Peru, Ollanta Humala, speaking at the Official Inauguration of the Amazon in Iquitos. TVPerú covered the president’s speech and uploaded it to YouTube under the title “Noticias Jefe de Estado en Loreto“. 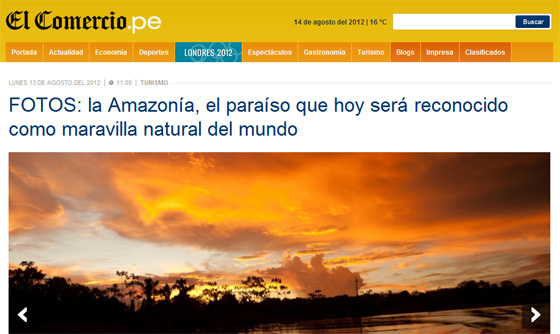 “FOTOS: la Amazonía, el paraíso que hoy será reconocido como maravilla natural del mundo” was the headline on a graphic feature about the natural paradise that is the Amazon in El Comercio. 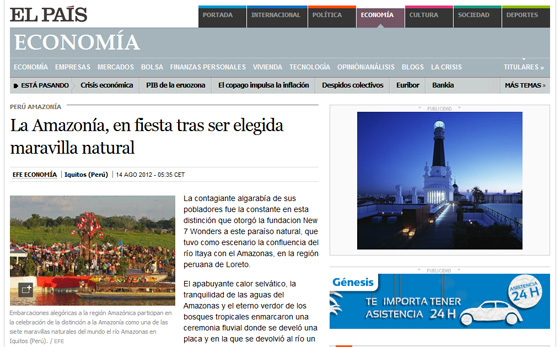 Meanwhile, Catalonia’s La Vanguardia noted that “La Amazonia recibe la distinción de maravilla natural: Este nombramiento se celebró, en el río Amazonas, con una colorida fiesta” in a report that highlighted the colourful festival that accompanied the inauguration.